Tomatoville® Gardening Forums Index > We're Here For The Tomatoes!™ > The Workbench: BIY™ > Let's Build an Argentine Grill. Let's Build an Argentine Grill. I am pricing steel to build one as a prototype and need input from folks as to what they would like in a grill and not able to find. I want to keep the cost down for the average person but stiil maintain quality. The grill will be wood or charcoal fired. The grill moves up and down when you crank the wheel? Is that how it works? The first time I've seen one. The one in the picture is a cheap one. Last edited by Worth1; July 7, 2017 at 08:09 PM. Reason: Yes NOT yesturday, phone spelling. When are you going to propose how to build a propane fire pit table, Worth? I need one. "rodizio" is the search term that'll produce a lot of images. They do it really well in Brasil too, especially the gaUchos, as opposed to gAuchos on the Argentine side. My idea of a fire pit would require stone work and fire brick. Gas fired I have no idea at a the time and would have to experiment. From the link Gerardo posted. I have built something a lot like this one pictured. The homeowner called it an inside grill. He was the one paying me so inside grill it was. If you are going through the trouble of cooking something nice use wood or charcoal. If you just need to fuel up, any heat source will do, but flavor will suffer. My $0.02. Mr Tode I cannot express to you how much I despise cooking on gas. But please folks if you wish put in your ideas on what you would like in a grill. Things such as height and so on. The height of the food cooking is most comfortable at 3'. That is the typical countertop height and what most people are used to cooking on - on a range top. 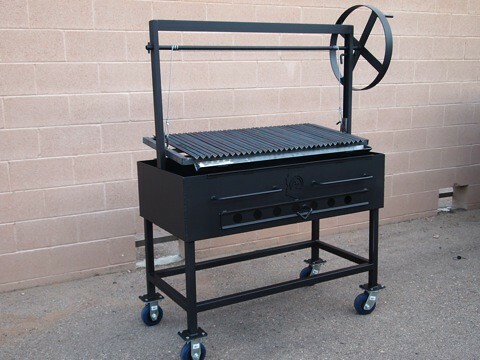 Ok heres a weird idea, leave the grill at Salts 36" and move the fire box higher or lower. If it were for me, at 5'2" a 36" height is perfect waist height. Any higher would be awkward and uncomfortable. Worth, there's a possible feature to include -- height adjustment so that both tall and short cooks can use it. I was thinking of you and my wife and other people about the height being too tall. I'm not much taller and anything over 36 would be too much for me too. And have thought about adjustable legs. But the weight of the grill is going to be tremendous and not conducive to conventional legs like the ones you see and have them be adjustable. At least in any way that would be easy on the go. I could figure out the weight of the finished grill before it was ever built. One thing to consider on a grill is you dont want the flames right in your face either. The optimum height of a stove top or grill would be where your forearm is at a 90 degree angle or parallel to the floor or a little lower. In my opinion I think 36 inches is a compromise at best. So adjustable height with at least 12 inches of adjustment starting at 30 inches and stopping at 42. Next is that contraption over the grill to raise the grill up and down. I think the grill needs a cover also and a way to have a rotisserie. Okay what about surface area of the grill?